One Dog Collar for Your Dog and One Small Collar for Your Wrist: I bought the OmniPet Luxe Leather Dog Collar in Jade from Amazon. I chose this style because it comes in a variety of sizes and I liked the colored leather. For my wrist, I purchased the 1/2″ X 10″ size and, for Henry, I chose the 3/4″ X 16″ size. Feel free to use any other dog collar you choose, as long as there is a size that you can wear on your wrist and a size to fit your dog. Embroidery Floss: You can find individual skeins from your local craft store, or can purchase a large multi-pack from Amazon. You will probably only need one skein of each color. 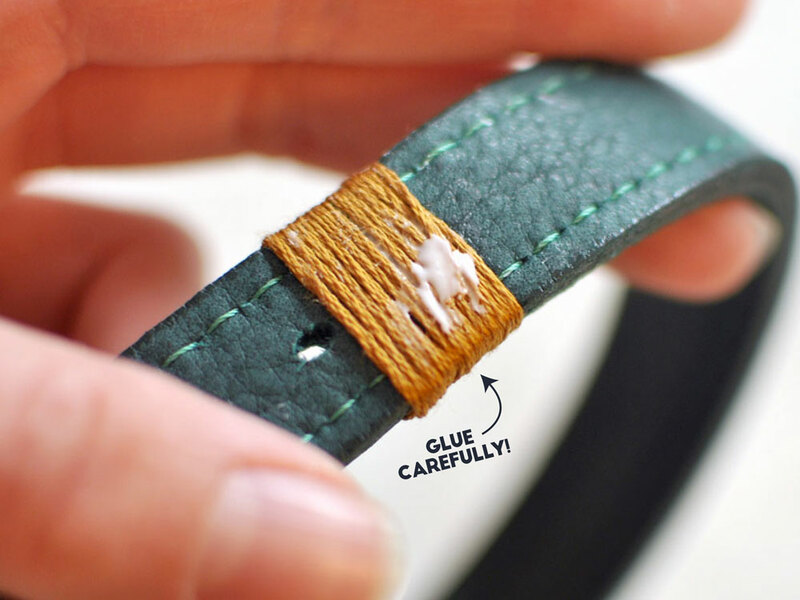 Glue: If using a leather collar, I recommend looking for a leather-specific glue like Alene’s Leather and Suede Glue. You can also use a glue gun or Tacky Glue, which is what I used because I had it on hand. Lay out your floss in the order that you would like it to appear on the final products. 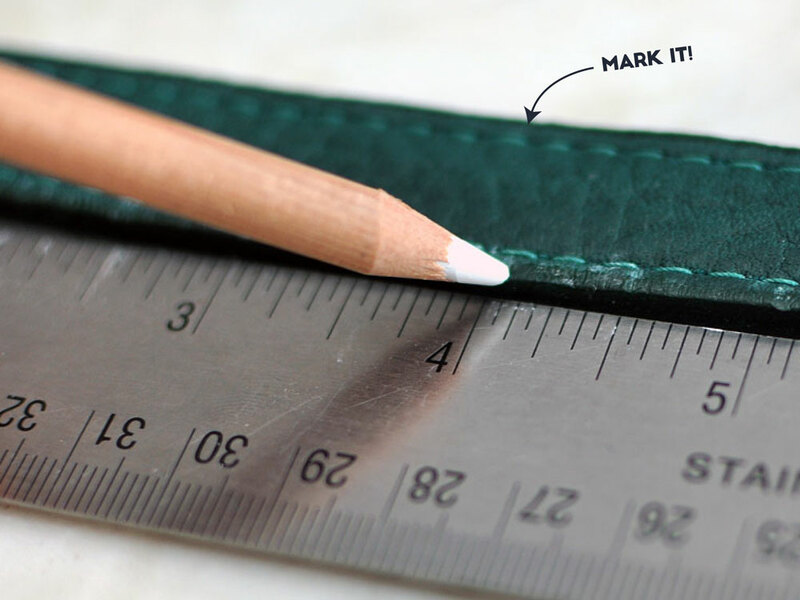 Subtly mark where you would like each color band placed using a marker or pencil. This step isn’t mandatory, but will make the next steps easier. I made each band 1/2″ wide for Henry’s collar and 1/4″ wide for my bracelet. Dab a tiny glue bead where you would like a floss band to start. 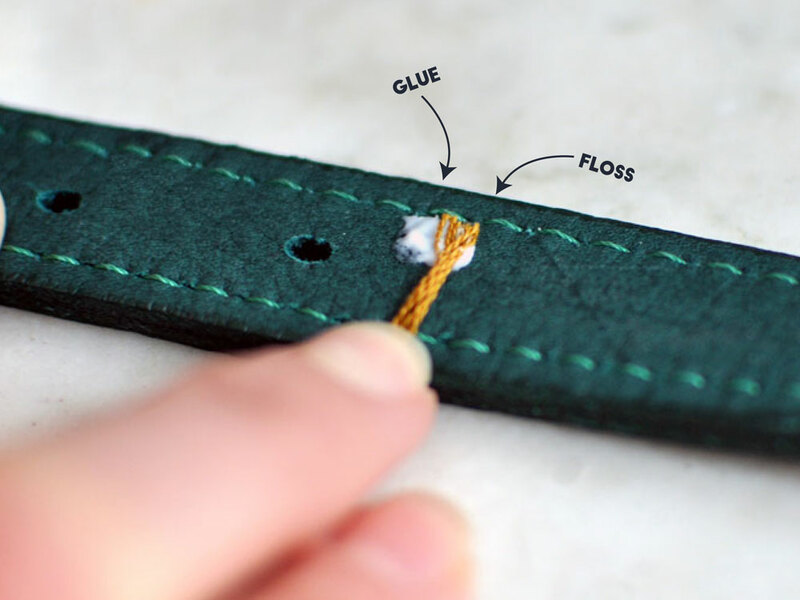 Carefully press the end of your first floss color into the glue. 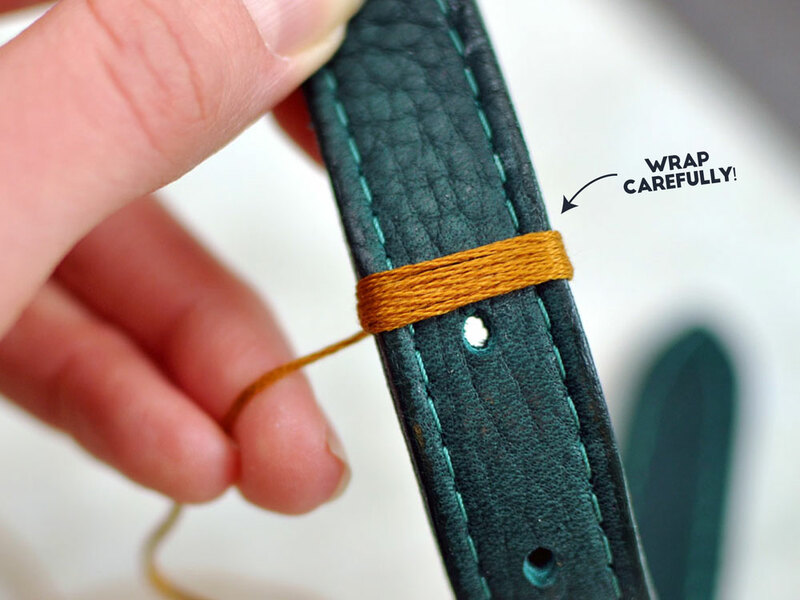 Wrap your floss around the collar, stopping when you’ve reached the desired width. Glue the thread end to the back of the wrapped band, making sure to completely cover the tip so that it stays in place. Repeat steps 2-4, alternating colors in whichever pattern your choose. Then, do the same on the other collar. You may want to wait for each color to dry before moving to the next one — this prevents a little mess! Wait for the glue to dry, then wear away! Easy, right? This project probably took me a half hour or so, and I now have a fully-custom matching set for me and Henry. You can also shop pet and discount stores for cheaper nylon collars if you prefer, and save even more money! Plus, this project is perfect to reflect your favorite team or school pride: simply choose the coordinating colors for the collar and embroidery floss! Which colors would you use? Let us know in the comments! This is adorable, what a creative way to use embroidery floss. Tootsie and I would have to go with pink, black and white! I love this idea! 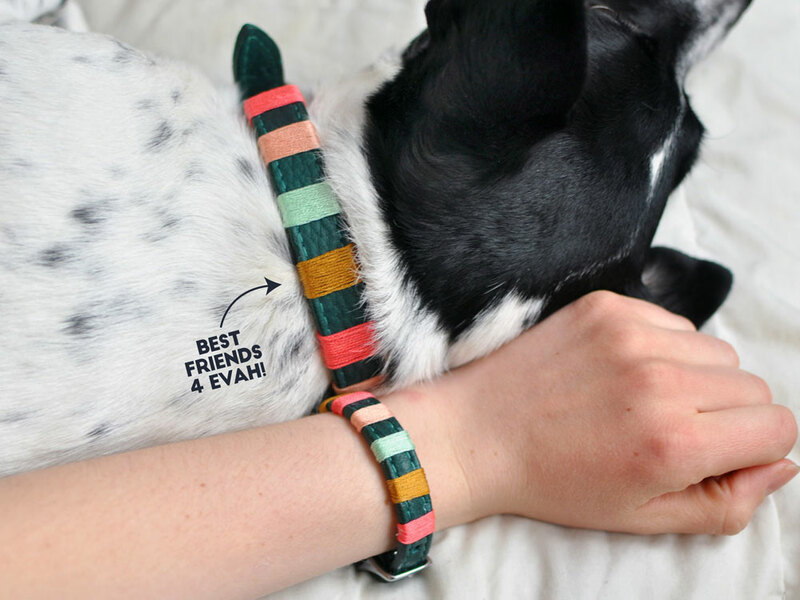 I keep seeing the friendship collar/bracelet idea but I like how you made your own! I think I prefer this method so you can really personalize it! Oh what fun! Love the clear step by step instructions and looks like something even I could do. 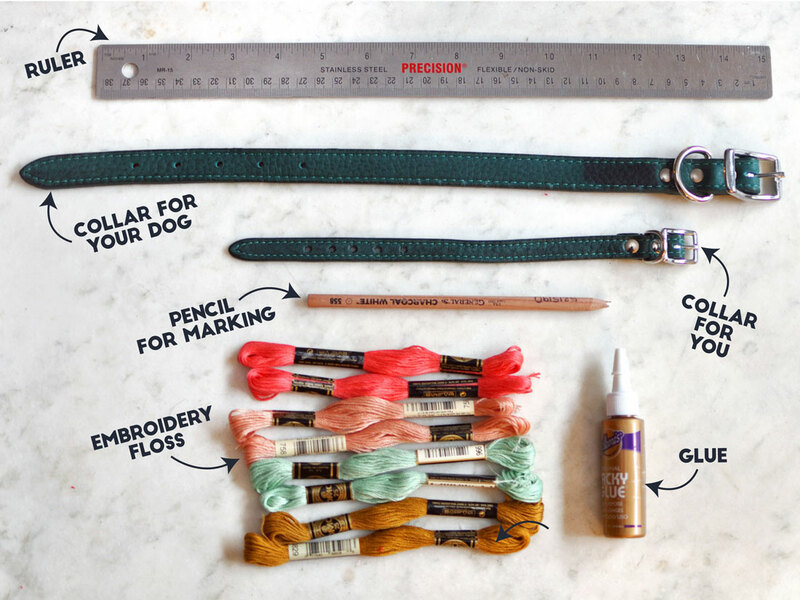 Edie doesn’t wear a collar, she is more of a harness kind of dog 😉 but I think this is a great project and an easy one even for me! Maybe I’ll give it a try to brighten up her harness! My daughter and her bff are totally into crafting and love their dogs. I am going to show them this! TOO CUTE! Thank you! I had a lot of fun doing it and it’s a pretty quick project as well! These are adorable friendship bracelets! The instructions are so easy too, this would be a great mom and daughter craft project for the weekend. I love the idea of a mom/daughter craft session! very cute!! My little dude can’t do collars sadly – but maybe … bottom part of his leash? lovely idea. Is that bottom pic a printable? * highpaw* Love it. I wonder if you could prolong the life of your creation by adding a layer of sealer (something more flexible than varnish?). We love you can co-ordinate colours with your pup too. Well done! These are so cute! I love the colors you chose. I might try and make some for my gang. That’s a really neat idea! It brings back a lot of fond memories. Thanks for this post. These are truly adorable! You know my history with DIY projects, but I’m wondering if this is a project my daughter might like to try – she has many more DIY skills and patience than I have. P.S. : Your photos are AMAZING! I don’t even think I could make the photos look this great much less the project. But gosh, these are cute! What a cute, crafty idea. The whole family can have the same bracelet. This is so cute! And the steps actually seem easy enough for me to be successful at it (I am not crafty…but I want to be)! So excited to give this a try…thanks for the AWESOME instructions! 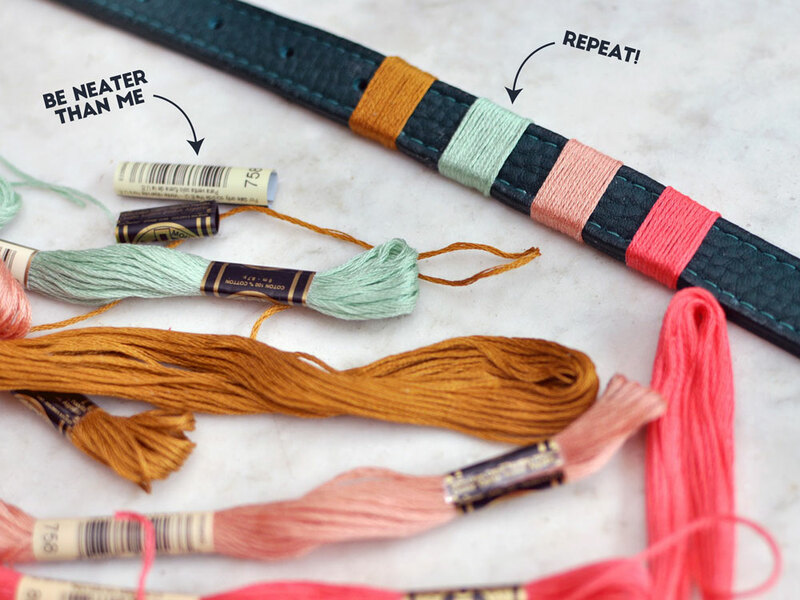 We absolutely loved these DIY friendship ‘bracelets’! It brought back such fond memories of making these types of fun gifts with my girlfriends growing up! That is such a fun idea! I love the colours you selected.